Meenal was a very bright student not only in academics but also in sports. Since childhood it was her dream to be a national badminton player someday in her life. Her parents supported her in each and every way they can to achieve her dream. At the tender age of just eleven, her parents got her enrolled in badminton camp for fine tuning the skills required to master the game. Siddhant was her coach, guide and mentor for the two month programme. Meenal used to leave home at seven in the morning and come back at two in the afternoon an hour late than other students. Siddhant was very impressed by her and constant feedback from him helped Meenal to improve a lot. One bright day, Siddhant asked her to wait in a room for personal grooming as a part of camp. Meenal was very excited with the constant feedback, motivation and extra care and support she used to get from Siddhant since day one. Siddhant entered the room with a bright smile, eyes constantly looking at Meenal determined with blood rushing through the entire body and movements around his pelvic region which he only can feel. He was too close for Meenal’s discomfort and the poor student was subjected to Child Sexual Abuse. That day, that time her soul died, crying in pain and discomfort. God was left watching as a mere spectator. Raj and Simran were busy planning their daughter’s birthday. Only three days were left for the big day. Each and every arrangement was being made minutely with extreme care so that nothing falls short than an extraordinary birthday party. The only thing that was still undecided was which clothes to wear, whether to buy new or arrange from those there in the wardrobe. Raj decided of buying new clothes for all as it was their daughter’s first birthday party. So they went to a mall to purchase the new clothes. Simran checked out few clothes and decided to have a trial on some before actually purchasing. And she entered the trial room. Simran being a modern day girl looked around the entire room, checked the mirror by placing a finger on it. Everything looked okay and thus she proceeded. But little did she knew that there was a spy camera located on the upper edge of the mirror. Everything was captured in the spy camera. That day, that time Simran was tormented to a crime caused by inhuman people. But God was watching in shock along with embarrassment of creating such disgusting people. Aasma had just turned eighteen last month. She was working as a receptionist in a small company full of males. Their parents had started looking for a suitable groom as she had turned eighteen and wanted to get rid of the burden on their head. Salim, her colleague was very much interested in her and he left a proposal to her parents. Salim did not want anything from her and her parents which propmpted to marry of Aasma to Salim. On the first night she waited for Salim to come up to her and take her into a different world altogether. But little did she knew of what was awaiting for her. Salim came with a lighted cigarette in his hand and went towards Aasma. He slowly made her get rid of her clothes till she was completely naked and then pressed the lighted cigarette on her belly, thighs, neck, buttocks and every part of her body. This was his way of showing love to her. That day, that time she was dying in pain and horror but suddenly mustered courage and kicked him right under his belly. And there he was lying in pain as somehow Aasma managed to run away. God was watching this in fury with a slight tinge of happiness. 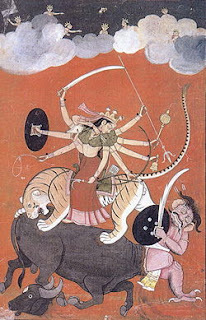 Durga was in fury and was striking hard with vengeance. She had come with a mission. Mission to eliminate those inhuman people inflicting pain, tormenting women to various types of violence. She hit them hard as she did while facing Mahishasura, a demon. “Roar with delight while still you can, O illiterate demon, because when I kill you, Gods themselves will roar in delight”, proclaimed Durga while her sword hitting them with brutal force killing them instantly. Keeping my fingers crossed is definitely a cliche but that doesn’t mean we lose faith in God and at the same time behave like Gods. Atrocities against women have increased by leaps and bounds and we need people to educate themselves about how gruel a crime it is. And if the situation doesn’t improve then who knows Goddess Durga might herself come down to earth to avenge the crime carried out against women. And beware! Durga Puja and Navratri are just days away. Probably this might be the right time for the Goddess to descend down to earth.